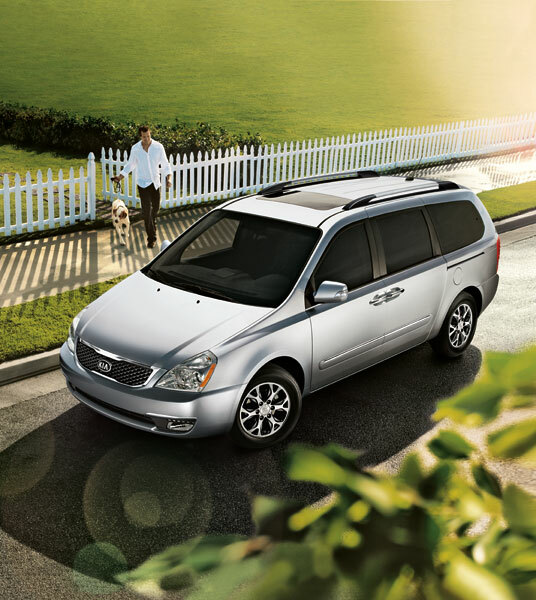 The 2014 Kia Sedona has hit the market and it proves to be a valuable option for minivan owners. The 2014 Sedona comes equipped with a 3.5-liter V6 engine with a 6-speed automatic transmission. With this power, it wins 24 mpg on the highway and 17 mpg in the city. The standard 2014 Kia Sedona features an updated front grille and bumper that take this minivan to the next level in style. LED lighting, front fog lights, Bluetooth technology with voice recognition and third row seats that fold flat for extra storage are also part of the standard package for the Sedona LX model, starting at an affordable $25,900. The EX version offers tempting options such as a sliding sunroof, comfortable leather seating and wood-grain accents. A handy navigation system is also a part of this more luxurious model. In both models, Kia has taken thorough precautions to protect their passengers. The 2014 Sedona packs six air bags, including full-length side curtain airbags. Additionally, it incorporates brake assist and traction control systems to help the driver maintain control despite the inevitable external factors faced on the road such as traffic and inclement weather. Side-impact door beams stand ready to absorb the impact of potential accidents. With its sleeker look and focus on meeting passengers’ needs, the 2014 Kia Sedona is a top-of-the-line pick for lovers of the minivan. Brought to you by Midwest Kia in Wichita, KS.